Big Finish: Doctor Who - THE OSEIDON ADVENTURE Review | Warped Factor - Words in the Key of Geek. 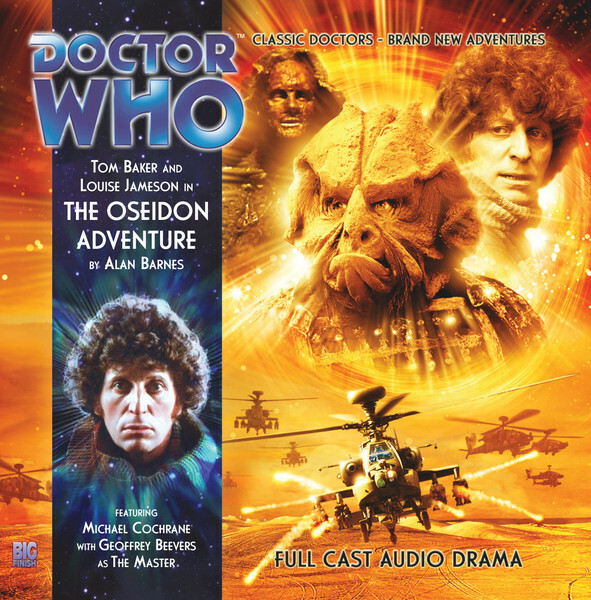 William Egan continues his look back through the audio adventures of the Fourth Doctor with the finale of series 1, The Oseidon Adventure. If you can cast your mind back, the Fourth Doctor’s previous adventure had ended with him wondering just who was about to come through the wormhole to become the Master’s accomplices. It’s fair to say it’s not who you would expect-or who the Doctor expects given his rather shocked cry of “Oh my prophetic soul” as the villains are revealed. Due to the title and cover it’s not too big a spoiler to reveal that after 35 years, The Oseidon Adventure sees a return appearance of the Kraals. Yes, really. While The Android Invasion is a perfectly enjoyable slice of Doctor Who, I highly doubt that there were thousands of fans clamoring for the Kraals return. There almost seems to be a contract in Big Finish somewhere, which indicates that every ‘one off’ monster/villain of the classic period must re-appear in a Big Finish production. This would be a very good thing if we were to see a new side to the adversary, along with some development. Alas, The Oseidon Adventure fails to do either of these things. It’s fair to say that in The Android Invasion the Kraals were generally pretty useless, and it‘s the same here. They seem to have been placed for nothing more than comedic value, displaying virtually no sense of menace at all. Kudos to Dan Starkey for getting the voices so perfect, but overall it seems like a disappointing and quite frankly pointless return. The first series of the Fourth Doctor Adventures has been rather ‘nostalgic’ in general, with only two episodes having an original villain, which does go somewhat against the televised era. Thankfully, the other villain of the piece is served much better than he had been in the previous installment. There’s a great twist to explain quite why the Master’s behavior in Trail of the White Worm was so odd, and it’s good to see him back in fine form. Geoffrey Beevers is, as always, simply wonderful on audio, and it’s particularly nice to hear the Master actually face off against the Doctor and Leela. While I have some reservations about overuse of the Master in the later Fourth Doctor Adventures, any scene with Baker and Beevers in it is going to be good. Michael Cochrane is better as Colonel Spindleton, although the character is still a little one-dimensional. His demands to the government are very funny (“Abolishment of the BBC!”), making him sound like a more upper class version of Basil Fawlty. The character and Cochrane get more to do at the end, including a surprisingly touching scene. If there’s one place where The Oseidon Adventure really falters it’s in the general plot. While the trailer promised some fights with 70’s UNIT, these scenes are very brief and somewhat lost in the plot. The reasoning behind the Master opening up the wormholes is fairly good, but the ‘stealing a TARDIS battery from UNIT’ smacks of lazy writing. It’s a great shame that the actual plot drags the story down, as there’s a lot to enjoy, not least the Doctor and Leela. I’ve mentioned many times before but Baker and Jameson are once again a joy to listen to. There’s a particularly lovely moment where the two ride a horse on Oseidon, clearly enjoying being in each other’s company. Despite an off performance from Baker in the first story of this series, since then the pair has become the definite highlights of the ranges first season. The Oseidon Adventure does feel like a microcosm of the overall first series of the Fourth Doctor Adventures. The Doctor and Leela are as usual superb, while there’s some treats to be had in the general story (The Master in this case). Yet, there still seems to be too much nostalgia (Kraals), while some of the plots have ended up being fairly lightweight and somewhat undeveloped. There’s clearly something to build on for the future Fourth Doctor Adventures though. Is it worth buying? On it’s own I think The Oseidon Adventure is just about worth a purchase, if you want a nice, easy listen. The first part has let it down a lot, and overall it’s a somewhat underwhelming finale to the series. Studies archaeology by day, frees the universe of evil, injustice and cold tea by night. William walks in an eternity of cult BBC science fiction series and Big Finish. Follow him on twitter.